Although some firms consider hiring a chief content officer (CCO) a best-practice, it turns out that bringing an executive on board at that level hasn't been realistic at most companies. Most B2B organizations (other than publishing, communications, and media companies or agencies) don't have a person with chief content officer title who has a seat at the CEO's table. 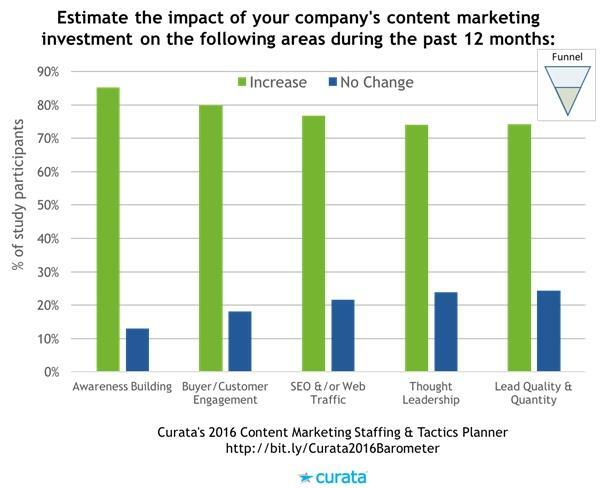 Not to worry, though: similar to the results of a Content Marketing Institute and MarketingProfs study, a 2016 study conducted by Curata found that 75% of companies are increasing their investment in content marketing, and 43% are increasing staff levels. Chief marketing officers have recognized the need for a core content marketing team, led not by a CCO but by a content executive (typically with a marketing operations manager or writer/editor title), who develops and orchestrates a content strategy across the company. Let's be clear: Content marketing works. It consists of non-egocentric (i.e., end-user-focused rather than product- or company-focused) content that helps buyers with their jobs and careers, along with the more traditional product-centric content vendors have historically created. Marketers are seeing the positive impact of their content marketing across the entire buyer's journey, from awareness-building to demand creation and sales enablement. The proof of the business case for content marketing is that 74% of marketers indicate that their company's content marketing investment results in an increase in lead quality and quantity. Pawan Deshpande is the founder and CEO of Curata, a leading provider of content marketing software. He is an accomplished entrepreneur, marketer, and technologist.